Rosenthal Ranch Series: I was commissioned to make four pieces for a family in Brooklyn. All four pieces are entirely solid wood made out of reclaimed pine, and use frame and panel construction with mortise and tenon joinery. 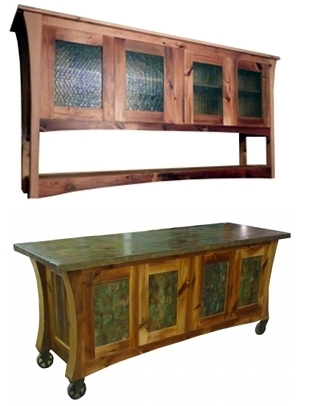 The Buffet top and door panels are copper with layers of patina. The upper buffet has antique chicken-wire safety glass in the doors. The clients were wonderful to work with and had great ideas. It was a very successful collaborative experience.